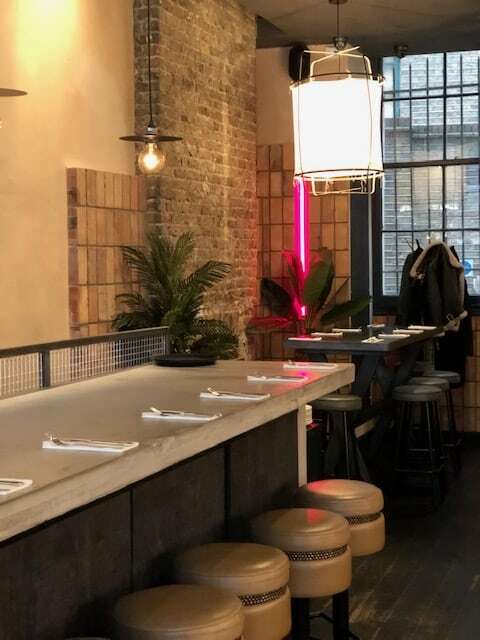 Burger and Beyond have finally opened up a permanent restaurant on Shoreditch High Street. 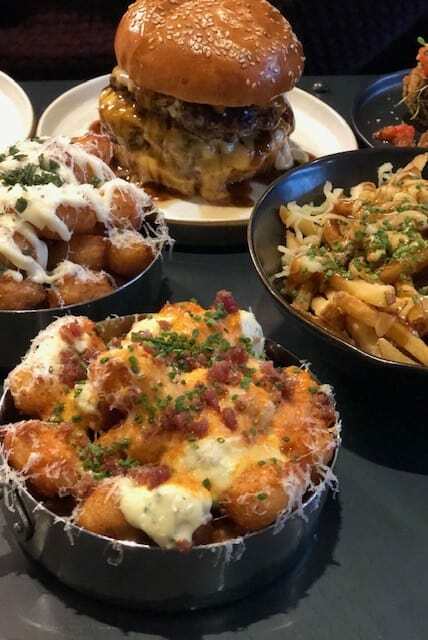 As most of you hopefully know, Burger and Beyond (founded by Craig Povoas and Tom Stock) has been killing the street food burger scene for a number of years with its amazing burgers and legendary tater tots. The restaurant expands on this offering with an extended menu of sides and small plates alongside the burgers. 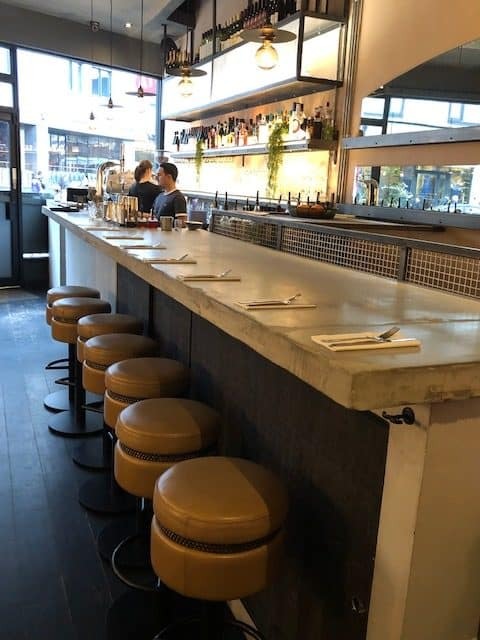 Think stripped back décor in a small and intimate restaurant which offers (in my opinion!) the best burgers in Shoreditch. Make sure you arrive hungry as the menu is fantastic and the small plates can’t be overlooked. 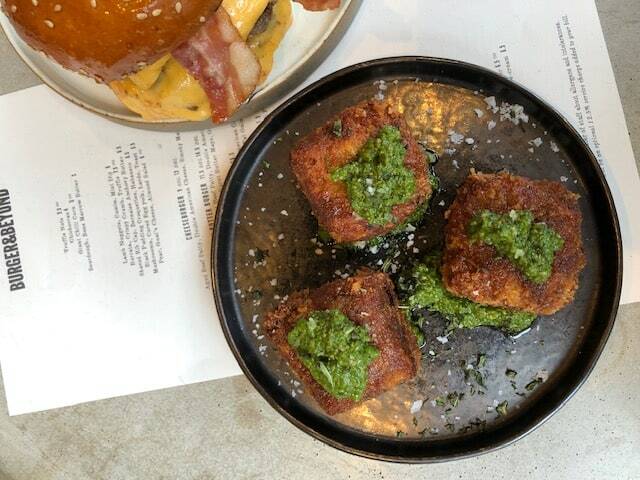 We tucked into the Lamb Nuggets, Cumin, Mint Dip (£6 for three) which were so tender and flavoursome with the accompanying dip – a real favourite. The Shaved Rib Cap, Anchovy Butter (£6.50) was a seriously impressive dish – the meat was tender and tasty. Lastly, we tried the Black Pudding Croquettes with Habanero (£6.50 for three) which gave the dish a real kick. Before dining at the restaurant we had sampled the burgers at their residency in Camden Assembly so I knew exactly how good they were. We opted for the Double Bacon Butter Burger (£11.50 single and £14.5 double). 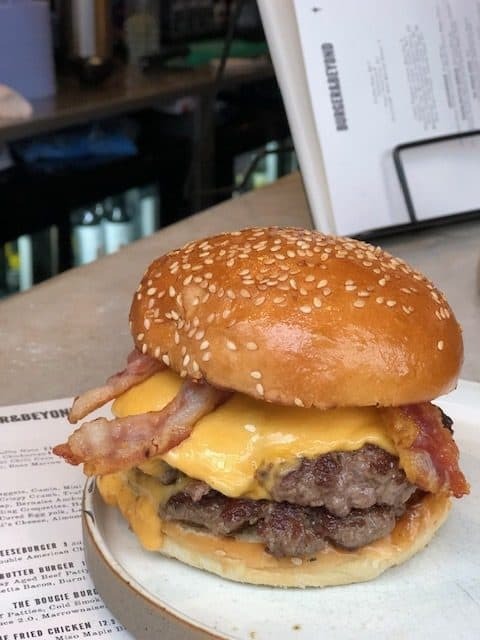 This was served with their Signature 60 Day Aged Beef Patty, Double American Cheese, Crispy Pancetta Bacon, Burnt Butter Mayo, Onion. 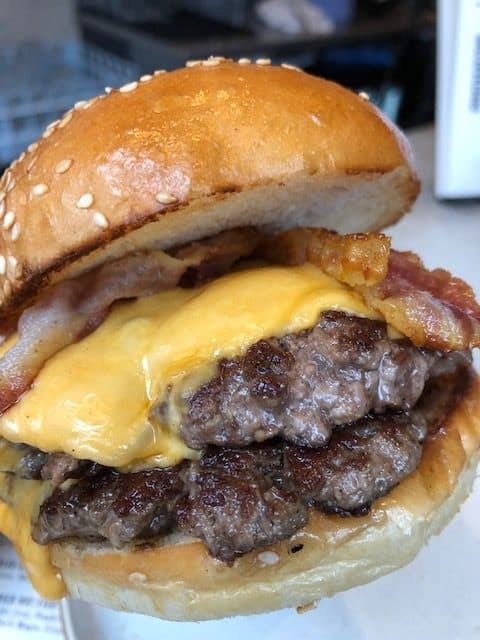 Their burgers are made with rare breed beef that is dry aged for between 45 and 90 days showing they clearly do not scrimp on their ingredients. I had my burger with the burnt butter mayo in the side (yes, I am strange!). Removing the dressing would normally result in a drier burger but this was certainly not the case here. The burger was just perfect. I literally enjoyed every single mouthful – it was so tender, melt in your mouth, not too messy and just SO good. This shows how consistent Burger and Beyond are with their offering which is SO important. The table also ordered the infamous Bougie Burg (£16.5) with 2x Aged Beef Patties, Cold Smoked American Cheese, Steak Sauce 2.0, Marrownaise, Beef Fat Onions. This was a huge and messy burger but in the words of one of the attendees (who is a chef) “best dirty burger I’ve had in years”. Says it all really. Accompanying the burgers are some epic side dishes. We opted for the Fries, Bone Marrow Gravy, Cheese, Truffle Tots and Dirty Tots (all £6.50). For those of you who don’t know, tater tots are deep-fried, grated potatoes! I You can’t leave here without trying the tots and I would definitely choose them over fries. The Dirty tots were my favourite served with parmesan, bacon, ranch and buffalo sauce, chives. Pretty punchier and moreish. We didn’t have room but if you can squeeze in dessert they have an epic sounding sour cherry cheesecake and deep fried blueberry pie with clotted cream ice cream. Drinks wise, a bottle of wine starts from £24 and cocktails are £8 including Old Fashioned and a Rhubarb Margarita. On first glance of the menu, we thought the burgers were a little pricey. However, given how delicious the burgers were and the quality of the ingredients, we just can’t grumble. We would much prefer paying a few £ extra for best burgers in Shoreditch! As above, make sure you get those Dirty Tots!